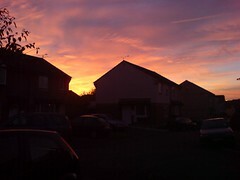 To test and try out blogging photos from Flickr I decided to share this old sunset shot I took just outside my home. It’s nothing fancy but hell if you’re going to do a test you may as well user something fairly pretty. I should point out though that this’ll probably be infrequent as my main site pntaylor.net is where all my current “arty” photography will go. I would guess that most of the stuff from Flickr will be mobile phone shots and quick snaps of random stuff. Whatever the posts will contain it’ll still be a useful little feature to have. Anyway, not much else to report other than I should be asleep so g’night all.